Blog posted by: Sarah Bishop, 4 March 2019 – Categories: A Brilliant Civil Service, A great place to work. 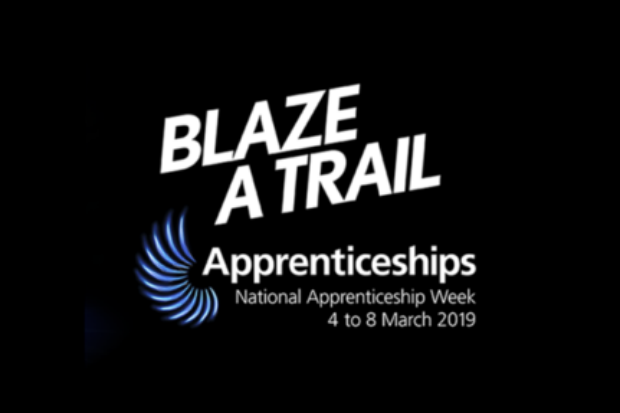 This year’s National Apprenticeship Week is all about celebrating apprenticeships and the positive impact they have on individuals, businesses and the broader economy. It’s also designed to challenge perceptions about what apprenticeships are and who takes them up. If you’re a director or team leader, you might not be convinced that setting up an apprenticeship is worth the effort or outlay. But I’d urge you to think again, as all the evidence suggests that apprenticeships increase employee motivation, productivity and loyalty. In a recent employer survey, 92% of companies who employ an apprentice said apprenticeships lead to a more motivated and satisfied workforce. Not only that, but 89% agreed they lead to a more productive workplace, with 70% believing they improve quality and service. And according to the evidence, 71% of apprentices tend to stay with the same employer. After all, if you’ve taken the trouble to nurture and develop people by offering apprenticeships, you’re sending out a clear signal that you care about their development. Your workforce will feel you’ve invested in them and will be motivated to give of their best. Apprenticeships can also help to create a more inclusive workforce, one of the cornerstones of A Brilliant Civil Service. Not only can they improve career prospects for existing staff but they can pull in new recruits, leading to a more dynamic workforce mix, with a range of ages and backgrounds being represented. They also give employers a great opportunity to tailor an apprentice’s skillsets to the demands of the business – a win-win scenario for everyone concerned. You’re probably aware of the ‘target’ for public sector bodies in England with more than 250 employees to employ an average of at least 2.3% of their staff as new apprentices from 2017 to 2021. But were you aware of the Apprenticeship Levy, which was introduced in April 2017? This requires all employers with a PAYE bill of over £3 million a year to pay an apprenticeship levy amounting to 0.5% of that pay bill. All government departments are required to pay the levy, regardless of how many apprenticeships they create. What’s more, they can’t use the levy ‘pot’ for anything else, as it’s ring-fenced for apprenticeships to improve the technical capability of our workforce. The great thing about this system is that departments can create as many apprenticeships as they like without incurring extra cost. The downside, however, is that any unused levy is returned to the Treasury after two years, meaning that employers who haven’t used it won’t get any benefit. Simply put, they either use it or lose it! The Civil Service offers apprenticeship opportunities in a broad range of areas – from operational delivery to leadership – with new areas being added all the time. Every government profession should be covered by 2020, each offering a clear pathway for career progression. Apprenticeships are also available across a range of qualification levels – from level 2 (equivalent to 5 GCSE passes at A* to C) to level 7 (equivalent to a master’s degree). There’s plenty of help available for departments, line managers and apprentices, so I’d encourage anyone who’s able to create an apprenticeship to go ahead and do it! It’s a wonderful opportunity and I guarantee you won’t regret it.